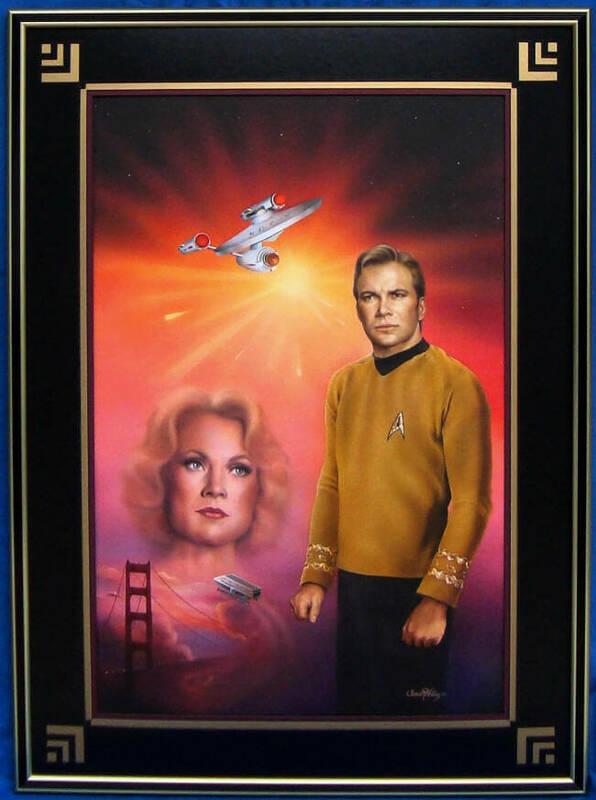 This page has my gallery of Star Trek paintings by award winning sci-fi/fantasy artist Sonia R. Hillios. All are fully original art, approved by Paramount, and purchased directly from Sonia, and all but one are professionally and beautifully framed too. 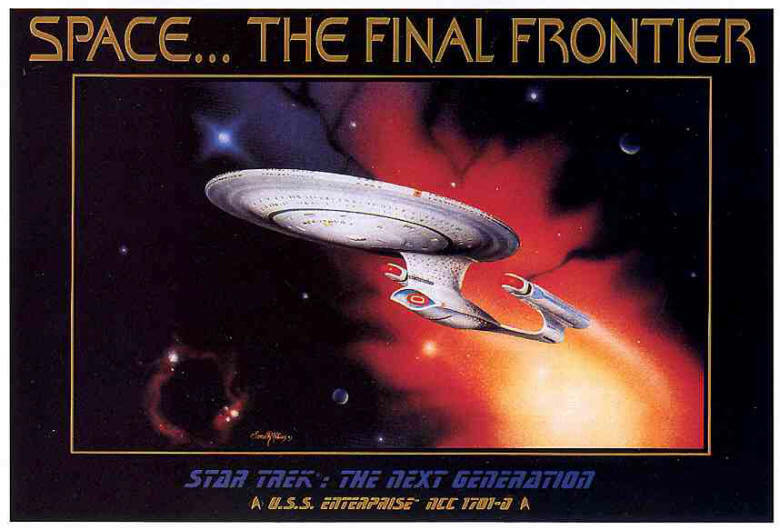 All artwork has been published on various licensed items, so they also have that "cachet" going for them. 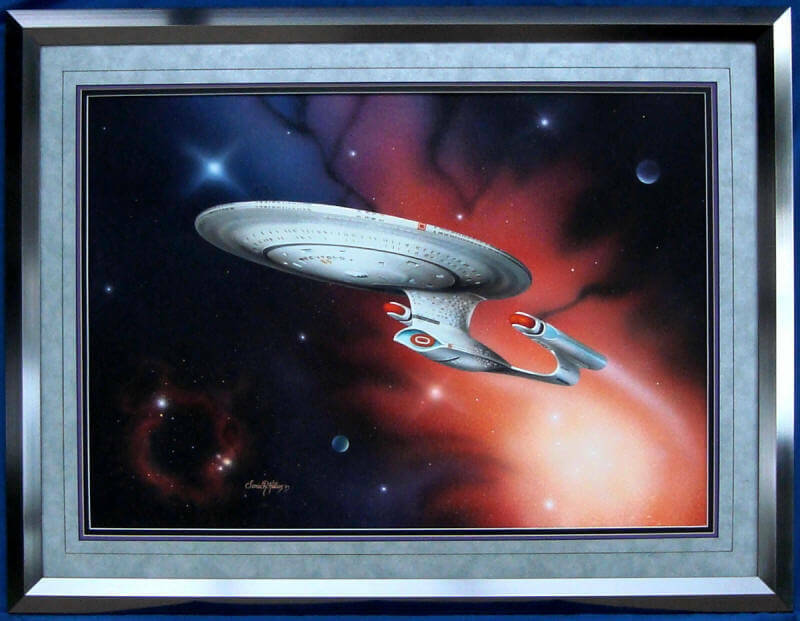 Most are below appraised value (from years ago too), and in my opinion are some of the best Trek art for the price you can find. Click here to jump down to the list and skip the blah-blah, or click on the above pics for larger ones. 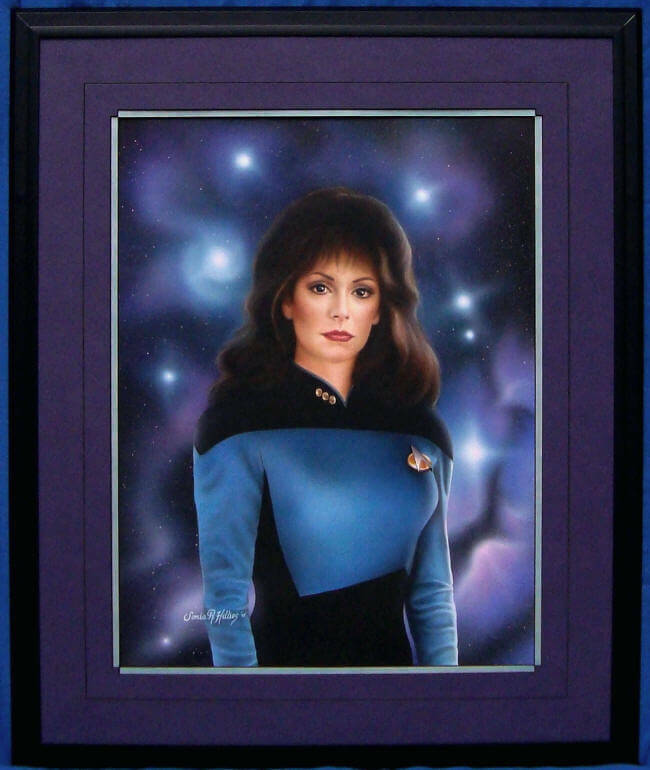 My other Trek merchandise is on my regular Star Trek page, including a few comics signed by Sonia. See my What's New page for site-wide sales announcements and price reductions. See my Feedbacks page for testimonials. PLEASE read the main points on the "How to Order" page if interested in buying anything, before you e-mail or call me, thanks. I can take credit card orders via Square's Invoice program. I'm NOT buying, thanks. Site navigation links are at the bottom of all pages. "View" links are set to open in a new window/tab, so just close them to return here. 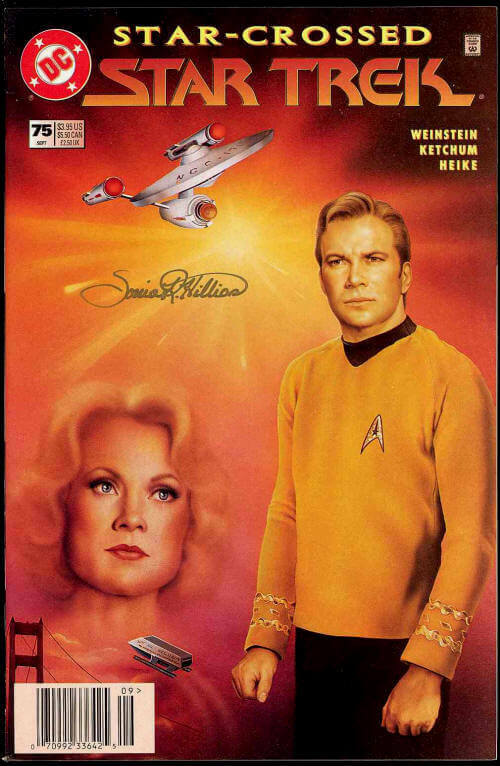 Sonia R. Hillios has done Star Trek and Star Wars art for Hamilton plates, DC comics, novels, trading cards, magazine covers, lithographs etc., and her work is gorgeous! And she's one of the nicest people you'll ever deal with. You can see more of her work at soniahillios.com (will open in new window/tab). I bought some of her originals in the late 1990's, and then later bought some more during a once-in-a-lifetime sale for past customers, as I couldn't let the deals go by. But I need the money back more than I need the paintings now. So now's your chance to buy some of these one-of-a-kind paintings, well below appraised value. And reasonably close offers are considered. And start making offers already, ok? I think that Sonia's art is a bargain compared to what you can pay for some fancy lithographs and Cibachrome prints, some of which list for $3000-4000, and those are COPIES folks, not the original. If you have that kind of money, why not buy an original in the same ballpark? Why pay $3000-$8500 for a lithograph there's 500-2500 of, just because it's signed by most of the cast of one of the shows, who will be signing stuff for years to come, when you could own an original painting of published art for less? You don't need to be Spock to see the logic in that. 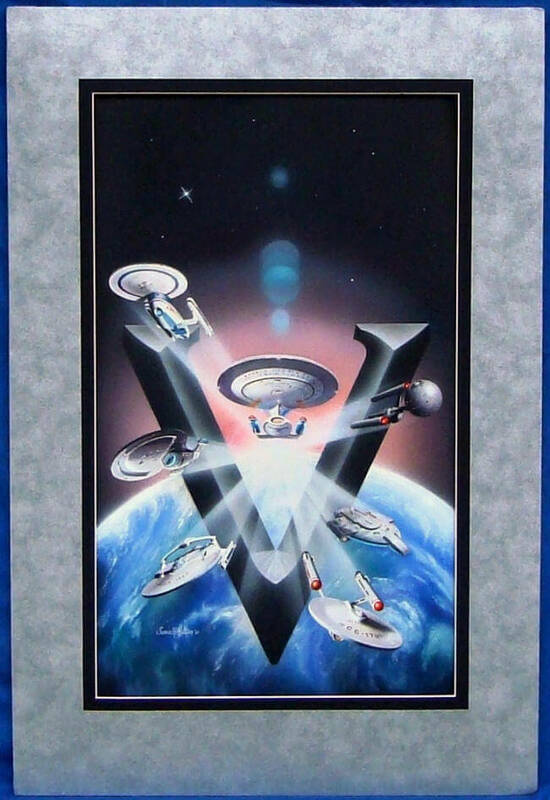 And compared to what some original pen & ink (black & white art) and painted small comic book cover art sells for, even more recent ones by big name artists, and what other Trek artists ask for theirs, these are a steal. So get in on these great pieces and prices now before they go into other people's collections. Explore strange new looks from spouses, seek out new lines of credit, new depths of debt, and boldly buy something that no one (except me) has bought before! Note: No matter how you pay, I will need a signed order/invoice before shipping any painting. This can be printed and snail-mailed to me using a copy of Square's invoice for credit card purchases, or my own that I email you. But I need a signed order to help protect against fraud and to help with any disputes that may arise, to comply with procedures with Square and my State Attorney's office. You will have to sign for the painting when it comes too, obviously. There's a notice taped on the back that is supposed to stay with the art, basically stating that all copyrights and reproduction rights to the images are reserved by Paramount and the artist, and that you can't reproduce the art in any form without permission. This means you can't go making posters and lithographs and the like from the originals without permission or paying a licensing fee to Paramount. And don't hotlink to the pics from here to use elsewhere either, that's bandwidth theft. Thanks. All art is hand painted by Sonia using a variety of techniques, including airbrush. 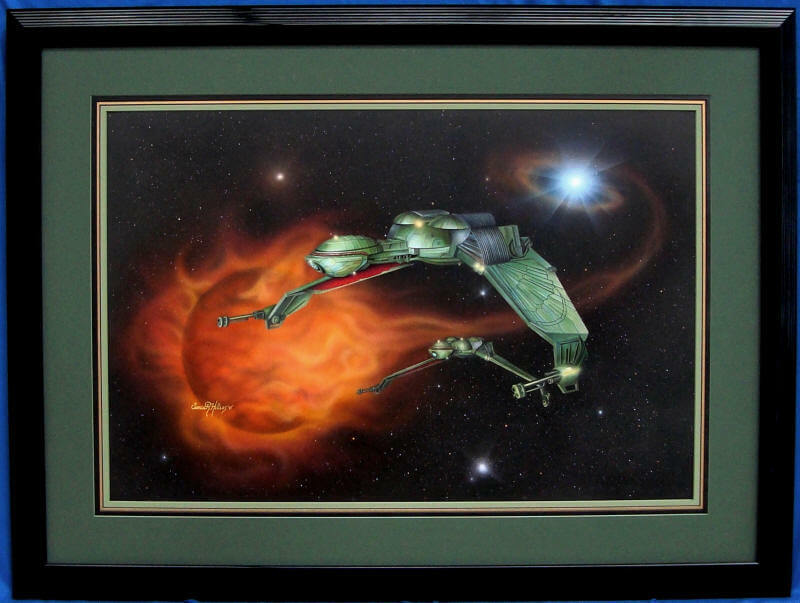 Framed with "acrylic glazing" (plastic type), not glass, so they're much safer to ship. Shipping estimates will vary by carrier and other factors. UPS will likely be the carrier of choice, or possibly the Post Office. Now for the list of paintings. Clicking on "View" will open the pictures in a new window/tab, so you don't have to keep hitting "back" and reloading this page. Due to camera quirks, some background "suns" or white spots appear larger/brighter than in person, some frames will have reflection spots, and colors may be off a little, as everyone's monitor settings are different. I tweaked things so they looked reasonably close on my monitor. "Image area" refers to the dimensions of the art showing inside the mat. NOTE: This is also on consignment at Comiclink.com, the link will go direct to my listing. They will sell/ship to buyers outside the U.S., so that's an option for those people. I MIGHT be able to do that (consign to them) for other paintings too, so inquire. 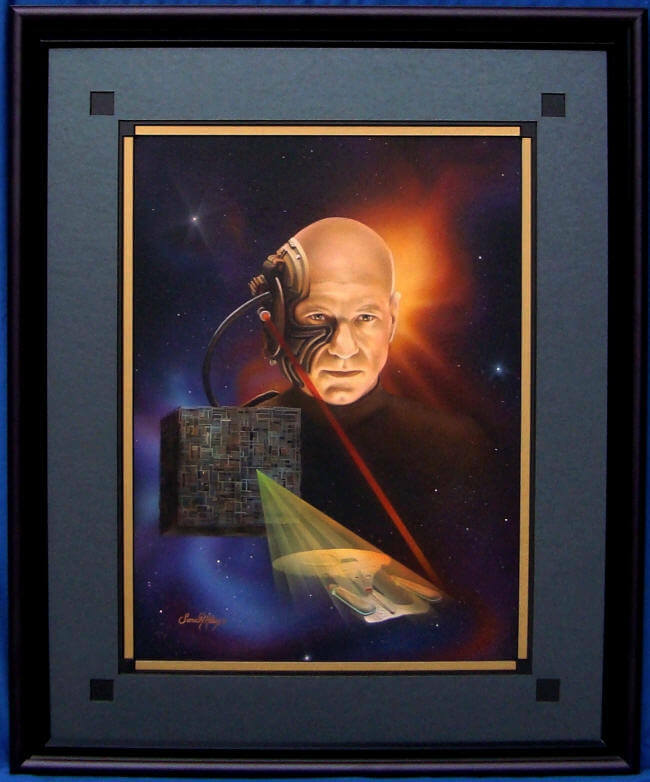 And for anyone who has the dough and wants more than 1 painting, we can talk about further discounts, if that charges your dilithium crystals, fires your photon torpedo, energizes your matter, ejects your warp core, presses your latinum bar, regenerates your Borg drone, makes your tribble purr—ok I'll stop.